In one of the earlier World Cup (FIFA) remembered Valderrama – mainly because of his hairdo …..
Carlos Alberto Valderrama Palacio, also known as El Pibe ("The Kid") is a former Colombian football player. 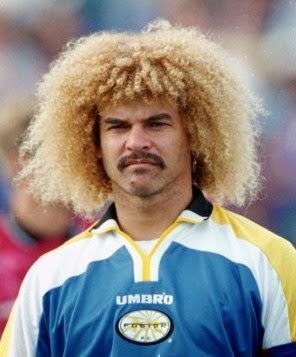 His mass of blond afro hair, coupled with his flamboyant technique on the ball, made him one of Colombia's most recognizable footballers. Had posted earlier about - Slinga Malinga – the pacer with unique action (some say blatant throwing) … Separamadu Lasith Malinga, bowls fast straight, toe-crushers and is unplayable in the dead. 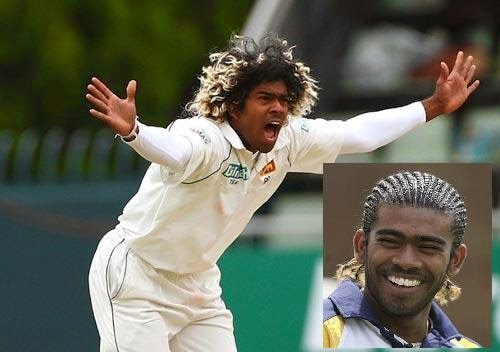 He is the first and only bowler in the world to have two World Cup hat-tricks, the first and only bowler to have taken three hat-tricks in ODIs and he is also the first, and currently the only, player to have taken four wickets in four consecutive balls in any form of international cricket ~ and Lasith has the most unusual and uncomman hair style. Remember seeing him with ordinary hair style in his initial days sporting whites……. ~ as years rolled by, his hair-do also started garnering more attraction……. appears pretty difficult to be maintained…..still…. couple of IPL seasons ago – Ravindra Jadeja was seen sporting a hairdo with letters CSK written .. ! In FIFA 2014, dramatic scenes as Portugal, sinking and sinking, scored a goal in the last 30 seconds to draw 2-2 and barely save their World Cup hopes. This means USA are not through yet, and all four teams are still in contention in this group. Portugal's Cristiano Ronaldo has been trending around the world since late on Sunday, not for his footballing prowess, but his latest haircut - a bold zigzag- y stripe on the right-hand side of his head. When he first sported the new style in public, a few hours before the Portugal v USA game, Twitter erupted in a collective round of head-scratching and mickey-taking. 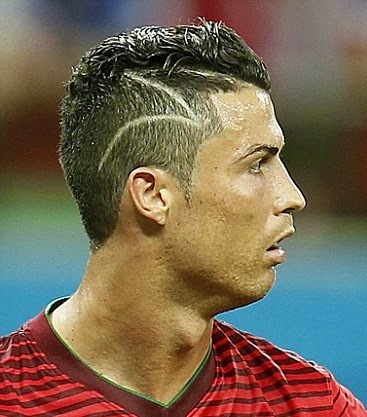 Some suggested it merited a place among the World Cup's "worst haircuts". Others wondered if it was a funky-looking "7" - similar to Ghana's Asamoah Gyan, who has a yellow "3" dyed into his hair. Cristiano Ronaldo is a massive social media star - with more than 110 million followers on Facebook and Twitter. A great player too but there has been widespread mockery of his locks - admittedly mostly from Americans - soon morphed into something completely different. A single tweet from a regular football fan with 900 followers seems to have been the trigger. The tweet read: "Ronaldo cut his hair to match the scar of a young fan who had surgery to remove a brain tumor last week. #respect." That tweet has now been shared more than 11,000 times. It was also copied word-for-word and reposted by numerous larger accounts. In all, there have been about 50,000 tweets and retweets. The problem is, there's nothing to suggest this is anything but a rumour. Ronaldo himself has not posted to his social media accounts since before Sunday's match, and neither his agent nor the Portugal team have responded in any manner ! Cristiano Ronaldo's new zig-zag patterned haircut; his new engraving on the right side of his head is less of a fashion statement and more of a kind gesture towards a young boy in Spain, is what the stories are all about. Ronaldo paid Erik Ortiz Cruz's entire £50,000 medical fee as he underwent brain surgery recently and the jagged line incorporated into his new haircut is rumoured to be a nod to the youngster's surgery scars. However, the Portugal captain very rarely speaks publicly about his charity work and is therefore unlikely to be tweeting to explain his tribute anytime soon.